Last Saturday our temperatures here in NE TN were a perfect promise of spring, so I got to my plot in the community garden and spent a very pleasant hour or so turning under the green manure crop of Crimson Clover while adding some organic amendments to the soil. The next day’s rain was the perfect finish. Now it will have a couple of weeks to break down before I plant ‘spring things’ there. It’s a rare fall that I get the planting of my winter cover crop timed perfectly so that it will fill in, without going to seed, before the cold weather fully hits, but I managed to last fall. Remember this? The now-brown quilt of clover served as a natural cover through the winter, and will now finish its’ part in the garden’s life by adding nitrogen-rich organic matter to my slowly improving soil. I added blood meal, rock phosphate powder and homemade compost to the bed and then tilled it all under. I plan to try a no-till method in some of my beds this year, in hopes that the earthworms will drag the compost and other amendments down deep to the plants root area where it’s needed most. I vowed when I started these beds from scratch last spring that as soon as the clay was broken down I’d stop tilling. I hope that time has come, for using a tiller is not sustainable and my goal is to garden productively without using fossil fuels or the pesticides and fertilizers that are made from them. I’m still not there, this picture proves it, but I do hope to be some day soon. In the meantime, I’m babying my starts of onions, kale, chard, cilantro and parsley that are growing on a make shift book case-turned-plant-rack. They’ll get transplanted to 4″ pots, slowly hardened off, and tucked into the prepare beds by the end of the month, along with potatoes, peas, beets, carrots, cabbage and broccoli-all ‘cool season crops’ too. After many satisfying meals this winter using our stored, canned and frozen fruits and veggies it will be wonderful to once again have fresh foods to add to the table. While I wait for the lettuce, peas and strawberries, I’ve started sprouting seeds in the kitchen to give us ‘something fresh’ right now. Sprouting is easy-peazy- something even I can’t mess up! All that’s left of that promising bed are the spinach plants, (lower left) which are still too small to harvest. Hopefully, not for long. In writing this post, I realize how many times I’ve used the word ‘hope’. My garden is always full of hope, if nothing else. I hope the seeds will sprout, I hope for a bountiful harvest, I hope the food we grow will nourish us and I hope that by showing you, my reader, how much can be grown with so little time, space and energy that it will inspire you to try your hand at growing something this spring too. All indications are that we will definitely see rising food prices as the year goes on. We already are actually. Hoping that won’t happen isn’t enough for me though. In a world where I often don’t feel I have much control over much of anything, growing my food empowers me like nothing else does! Right along with filling my pantry and my belly, gardening fills me with peace of mind and the knowledge that regardless of what happens in the world, I’ll always have the knowledge and skills to provide for myself and others. Hope really does spring eternal in the garden! With the extreme cold, I’ve found myself staying home more, cooking a lot, and making some minor changes in order to stay warm without having a $400 electric bill. Maybe one of these tips will help you reduce your energy costs and keep your home cozier too! Monday: It was a pleasant day but I knew the cold was returning that night so I washed the car at the quarter car wash then brought it home to vacuum it. I also spent time in the sunshine, soaking up Vitamin D while cutting back all the frozen and dead leaves from my kale plants and reinstalling the plastic covered hoops that had blown off in the last ‘Polar Vortex’ (which is why they froze to begin with!). My hope is that they will resprout once things begin to warm up again. Gardening is always a learning experience, and this is just part of that. Savings: $2.50 for the vacuum job, and if the kale resprouts, it will seem quite valuable indeed, coming back from the dead and all. At the very least, the knowledge I gain in growing food is always invaluable. Wednesday: The cold sets in…Michael made bread, using bread flour bought in a 25 lb sack for less than $9, 2 teaspoons of yeast bought in one pound foil-packed bags for less than $5 and a tsp of salt. Total cost per loaf: about 25 cents. But wait! The savings continue…while the baking stones preheated, I decided to use that time to bake some white and sweet potatoes on them, along with a pan of Shepherd’s Pie and a tin of egg shells (yes, egg shells are saved year round and dried; after drying them I grind them up for adding to my tomato and pepper planting holes each spring-doing so adds calcium and helps prevent blossom end rot). The Shepherd’s pie and one loaf of bread made 6 servings, which fed us, along with some unexpected overnight company. Then we enjoyed the company, along with the baked potatoes and some chicken and veggie leftovers the next day, finishing the impromptu meal with some summer-canned peaches for dessert. Heating the oven once yielded two loaves of bread, and two large meals. I’m already considering what other things I can cook while next week’s loaves are baking. Spinach lasagne maybe, more potatoes and a pan of macaroni and cheese perhaps? With just a little advance planning, cooking multiple meals offers time and energy savings. Thursday: The deep freeze continues…more time spent indoors, playing music, making soup, and dreaming of spring. I don my silk long johns underneath my clothes, and add more quilts to the bed. Heat pumps are notoriously ineffective in this kind of weather and we’ve found that by closing off unused rooms and dressing in layers we stay warmer. I stream free movies and hem pants while drinking herbal tea and staying by the gas stove. Friday: Zero degrees overnight last night, and I’m feeling like I live in Antarctica instead of Tennessee. Michael dons his long johns. We bring in the old kerosene heater from the shed, and fill it with $4 a gallon fuel. Using it and the gas stove in the living room we stay toasty without having to use the heat pump much at all. Two weeks ago I went shopping for an electric space heater, but the cheapest I found was about $40. Instead, I bought one for six dollars at the thrift store. It’s running on low down in the cellar, keeping our water pipes from freezing. I also installed some more foam insulators behind the wall switches and outlet plates, after buying a package of 14 for less than $2. Savings: $34 on the heater and perhaps hundreds of dollars and much aggravation saved over NOT having frozen or burst water pipes. Feeling cozy: priceless. But this Southern girl had never eaten, nor even seen, a parsnip, until I married my London-born husband. Nor did I care to. His love for this carrot-like root vegetable prevailed however, and now I love them as much as he does. So much so that I now plant them in my fall garden. Much like cool weather greens, parsnips ‘sweeten up’ after a few hard frosts. Since we recently had some nights down in the teens, I figured that was cold enough to sweeten them, so I walked down to my plot in the community garden today and harvested some of the parsnips and carrots I’d planted there last August. Aren’t they beautiful? They look good enough to eat, huh? 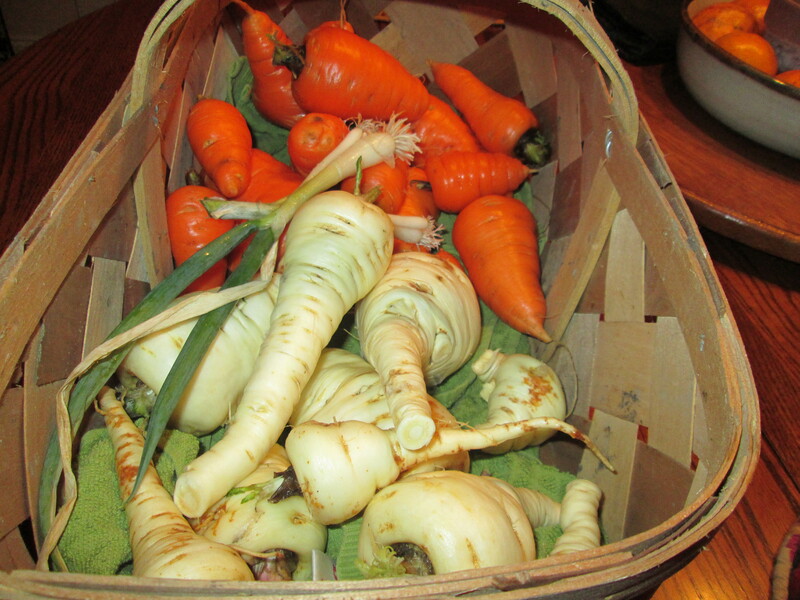 I harvested 5 pounds of those fat, stubby carrots that grow so well in the fall, and 3 pounds of the parsnips, along with some ‘spring’ onions too! None of these veggies were protected in any way except for a 2″ ‘blanket’ of shredded leaves, proving that you don’t have to use expensive greenhouses or heavy cold frames or even plastic covered hoops for these cold-hardy varieties. As an experiment though, I decided to leave some of them in the ground because I’m curious to see how they fare after being in the ‘deep freeze’ we’re expecting next week-temps are predicted to be -4 Monday night! I’m hopeful they won’t freeze and get mushy but the only way to find out is to let them be. I’ll post later to let you know how they fare. I couldn’t bear to lose a single beet though so I harvested all of them. Even though this time of year can certainly cause the window of locally grown foods to narrow considerably, there are still many fresh foods that can survive winter growing conditions or can be stored fresh without any or much preservation. Last week I took the fourth cutting of broccoli side shoots since the main heads were cut in early October and harvested 2 fresh heads of cabbage at the same time. Brussels sprouts look like they’re surviving with the sheet of plastic I put over them around Thanksgiving. I’m harvesting kale and parsley from my hoop house twice a week, but I’m pretty sure I lost my Swiss Chard during the recent cold night when the wind took the plastic off the hoops that covered the plants. That happened a few years ago, and even though the plants looked completely dead I left them in the ground, and because they are biennials, they literally came back to life the following spring in a beautiful flush of growth! I’m hoping for the same this time too, because I failed to save the seeds from those plants that reinvented themselves in spite of the odds, but you can be sure I will this time if I get a repeat performance. I did notice that the tiny spinach and bitter greens that were in that same hoop house didn’t seem to be bothered too much by the unfortunate exposure so I fully expect to be eating them by late February. I went to the grocery store today and noticed price increases in canned beans, tomatoes and milk. I suspect that may be due to the continuing severe drought in California. It’s been said that our next wars will be over water instead of oil. Those of us lucky enough to live in a place with an annual rainfall of 52 inches don’t have to worry too much but that could change tomorrow. I like knowing that I can grow fresh food year round with very little irrigation necessary, but a few rain barrels under the downspouts is still a good insurance policy! But there’s been no increase in the costs of my beans and tomatoes-in fact, I want to show you the last four Longkeeper tomatoes I have been waiting on to ripen-we ate fresh tomatoes in our salads the day after Christmas and I suspect these last ones will fully ripen in the next week or two… note to self: plant earlier next summer so we’ll have enough to last through more of the winter. Starting the new year with boxes of locally grown apples and tangelos from Florida, white and sweet potatoes that still have our garden’s dirt clinging to them, baskets of butternut squashes, garlic and shallot bulbs, and all the other canned, frozen and dried goodies that I’ve put up and written about in the pages of this blog gives me a sense of gratitude and comfort. Having the skills needed to provide yourself with good food, regardless of winter storms or droughts, regardless of Peak Oil or ruined Fukushima nuclear reactors, will hold you steady all your life. No doubt I’ll suffer some losses to this extreme cold snap that’s headed our way-probably my beautiful rosemary bush or some of the fruits and berries that were planted last summer. But it’s not the end of the world, and the setbacks continue to teach me new lessons that were begun by my grandmother 60 years ago. The BEET goes on. the cold, short days really are cause for prayer and Prozac. For those of us that love to garden this is the time of year that we begin to truly miss kneeling at our weedy altars. The answer to this annual crisis is found in my mailbox, right there with the Christmas cards and end-of-the-year requests for charitable donations. Just in the ‘nick’ of time, the seed catalogs arrive! The colorful, mouth-watering, dream-inducing wish-books can transport me right back to warm days and garden plots. Come late winter, when I feel like I can’t possibly look at another plate of kale, the spinach and chard will be filling this space with their tender sweetness that can’t be duplicated with winter varieties. Just in the Nick of Time. We enjoyed a wonderful Thanksgiving dinner with friends and family, and now, a week later, I’m putting up the Christmas tree. We produced more garbage last week than normal, but much of it was things our out-of-town company brought with them and bought while they were here, but I really did make up for it this week by cutting food and kitchen waste to ZERO and by reducing and repairing everywhere else I could. Remember, these little things really add up week after week and allow us to live very well on very little. And that’s basically what this blog is all about. … and the only thing I had to buy for the gallon of soup were the noodles and some celery. I had the onions, carrots, and herbs from the garden on hand and used a similar combination of veggies, plus some leftover beans and broccoli from the garden for the pie. Savings: 4 lunches and 4 dinners with enough for company too. Wednesday- I mixed up a batch of the same laundry detergent I’ve been using for almost 15 years. It’s environmentally friendly, produces no packaging waste, costs pennies per load and works very well. What else could you ask for? Here’s the recipe I have used all these years, made in the same free icing bucket I got from a bakery. Consider it an early Christmas gift. Grate 1/3 bar of Fels Naptha soap into 6 cups boiling water. (This all-natural laundry soap can be ordered online if you can’t find it locally) I use an old box grater on the fine side for this-see photo. And by the way, it’s very easy to grate. Hammer Washing Soda. Bring to a boil, Stir till dissolved and slightly thickened. In a 2 gallon bucket, put 4 cups hot water, then add the soap mixture, mix. somewhat, then use 1 c. per load. This works beautifully on average dirty clothes. For really oily or dirty clothes, you may want to use more soap, or hot water. I use cold, except for whites. This detergent is safe for greywater and septic systems too! These products can be found in the laundry section of most grocery stores. NOTE: There will be no color and little scent to this detergent, nor will you see suds. Sudsing agents are added to commercial detergents to help the consumer feel that the product is ‘working’. The suds add nothing to the actual cleaning power of the product. Savings? I’m going to estimate about $10 per gallon of detergent. This recipe makes 2 gallons or, enough for 32 loads for about $1.00 worth of ingredients. Fall is my favorite season too, even though it’s bittersweet for me, knowing what lies just beyond it. I’m still working on my summer to-do list, and now I’m in the midst of my fall list! Many of you have asked me to let you know what’s going on in the garden during each season, so I hope this helps, although I suspect I should’ve written all this out back in August. I hope it will give you an idea of where you need to be now anyway. All of my raised beds in my community garden plot are now planted to either fall crops or crimson clover, which I like as a cover crop for winter. I’m harvesting broccoli and lettuces, beets, August-planted potatoes, and carrots there, with the kale, cabbage and cauliflower ready in another couple of weeks. Brussels sprouts remain a mystery to me, but I still plant them anyway. Maybe someday I’ll actually get some sprouts from them! I always feel like it’s a race to get the late summer plantings almost to harvest stage before the fall equinox, because things really slow down by then. This proves to be especially tricky with Longkeeper tomatoes! I have full-grown plants loaded with green tomatoes now that were set out in August,. If they can just begin to turn pink before our first frost, they will slowly continue to ripen inside the house, allowing us to have fresh tomatoes until about Valentine’s Day- if we don’t eat them all before then. The key is that they won’t ripen if picked green, they must have at least a slight blush of color to continue ripening. I usually plant them out in July, so don’t have as many this fall as in years past, but we’ll still have enough to last til Christmas with any luck. Longkeeper -the name is accurately descriptive. Even though they’re not as sweet and juicy as a summer ripened fruit, they are far, far better than ANY grocery store tomato you might buy in mid winter. And by golly, they’re local 😉 Some Farmer’s Market vendor is missing the boat by not selling them during the winter months. I finished preparing my final bed today, turning in compost and shredded leaves. I’ll add some bone meal to the holes when I plant my garlic there at the end of October, but today I just raked it smooth and planted winter lettuces and spinach, neither of which will be ready until spring. With a simple little hoop house over that bed, those plants will just sit there, almost dormant, right in the row, until late winter. When the days begin to lengthen just a bit, that spinach and cold hardy lettuce will burst to life and offer us fresh greens, just about the time the kale and swiss chard grow tough and we’re tired of them anyway. Last, but not least, the parsnips that were planted way back in July won’t be harvested until after several hard frosts, but before the ground freezes solid (boy did I learn that the hard way!). The freezes sweeten them, and then they’ll keep in the refrigerator for a very long time; I consider it one of nature’s mysteries that just as my vegetable drawers are finally empty of all the fruits and veggies they held all summer, along come the greens, apples, nuts and root crops to fill ’em up for the winter. I set up another compost bin today, and will let the one we filled during the summer cook and decompose all winter, hopefully ready for use in the spring, with this new one full and ready for use by next fall. And so the gardening cycle continues. After all this intensive digging, planting, harvesting and storing it’s nice to know we’re moving into a quieter, slower pace in the garden for a few months. God willing, the wheel of good health and fortune will continue to turn and the seed starting trays will be full again come February. Happy Fall Ya’ll!